> corner lot > LA: 3200 sq. Ft. until 2090 tenure > 3bedrooms & 3bathrooms > renovated & bui. 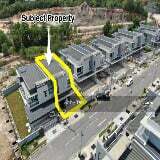 ...Close to public amenities and services available. 10 to 15 minutes drive to KK airport, JPJ, Donggogon town etc. Well maintained house. Taman Pertama (1st Garden) located at Donggongon access from Jalan Peter Mojuntin. 5 mins drive dist. Super Huge banglo for sale, suitable for VIP, airbnb for wedding purposes etc. Tenanted, fully furni.